Are you looking for a professional company that handles pool table installations? We can help you with getting your pool table setup! With our company you are guaranteed with risk-free pool table moves, installations or refelts with our exclusive ABIA issued 12-month service guarantee. Our Qualified pool table installers know your table type and will install it for the best playing experience possible. Pool table assembly is technical in nature and should be done by a trained pool table installer. Since we have plenty of experience with pool table moves, naturally we are experienced in the pool table installation side of the business. You may be shopping for pool tables for sale if you have reached this page. Check our listings of pool tables for sale in Indianapolis to help you with your search. If you need it professionally installed, leveled, and the cloth installed on it we can provide an excellent solution for you that is guaranteed and efficient. On a side note, many people don’t know that the best time to have a proper pool table refelting done is during installation so if you are considering moving or buying a pool table, check your options for new cloth when we install the pool table for you. Jump over to our contact area on the home page and send us an email or give us a call. During extensive leveling our technicians precisely set, shim, wedge, and level the slates using sensitive leveling equipment to make sure your pool table installation is done with the highest quality for optimum performance. 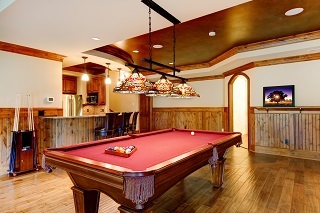 If you need us to bring the pool table upstairs, there may be an additional cost. If your pool table turns out to be a single slate top, we will definitely need to know the stair situation, such as turns or if going up or down since this type of tables are extremely heavy and sometimes we will not be able to move it because of liability issues, however. We will check for possibilities depending on the situation and circumstances surrounding the pool table assembly job. You’re also protected by our exclusive service guarantee issued by the only organization in our industry on all billiard table moves and installations that we perform, the ABIA. We will also pick up the pool table from a storage facility or your on-site storage before we do the actual pool table installation for you. Just let us know the details of your job. We have a classified section of used pool tables for sale in case you need help finding one. The pricing on an assembly will depend upon a few circumstances. Such as size of the playing surface, number of slates, brand or manufacturer, style of pockets and if there are any stairs to go up or down. Also if a new cloth is needed for refelting the table during installation. Please call in to go over the details and if there are special circumstances we can be prepared and take care of the job appropriately. Also the best time to take care of a pool table repair is when the pool table is in pieces. Is your cloth in good condition or would you like to change it when you have your pool table setup? Feel free to check our pool table room sizes chart to help you determine the proper size of pool table to get. *We can add Championship woolen felt or upgraded tournament grade worsted cloth for additional charges but you save if we refelt the pool table at the time of any pool table installations.